A Business Process Analyst or a Business analyst specialist illustrates implication from process details, links these inferences to make a clear picture keeping in mind the business objectives and targets. The role of a BPA is to identify and deliver improved process reports. The Business Process Analyst of a company is powerful enough to structure huge information inside a process outline. The other activities of a Business Process Analyst involve – process mapping, redesigning workshops, managing constant process changes, analyzing business workflows, facilitating workshops, monitoring processes and giving feedbacks. As a BPA of a Company, the individual is held responsible to interpret the business requirements of its IT sector. 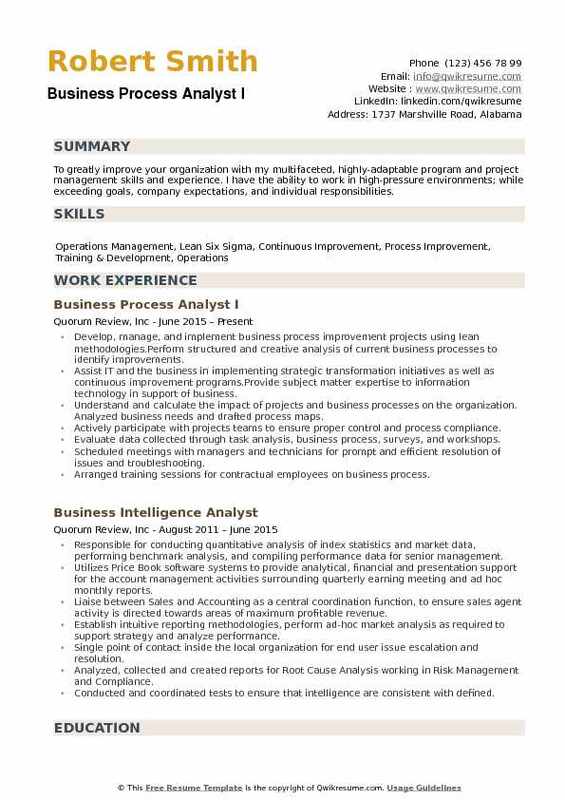 The minimum qualification needed to be mentioned in the Business Process Analyst Resume sample is a Bachelors Degree in Business or Computer Science, however hiring managers also consider individuals possessing Lean/ Six Sigma Certification, BPM certification and BA Certification for this job post. 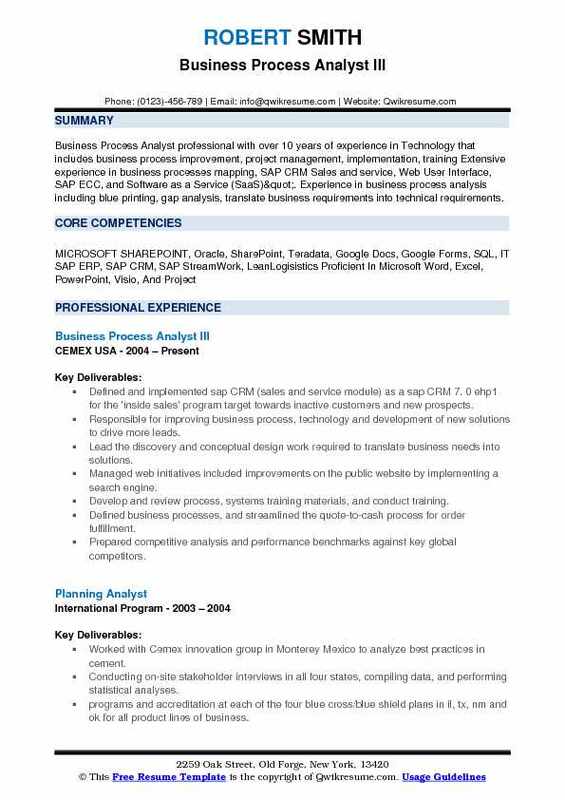 Summary : Accomplished IT professional with over 12 years of experience spanning several industries including retail, telecom, financial, agriculture, and biotechnology. 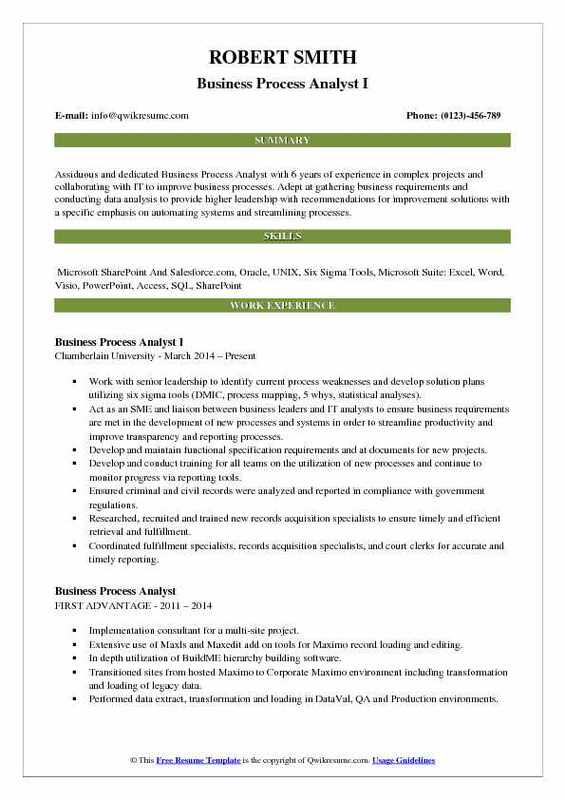 Professional IT experience includes project management, business analysis, use case design, user stories, data analytics, business process modeling, software and database development, application testing, release management, technical training, and technical support for web-based, client/server, and mainframe applications. Perform business analysis and create functional and technical requirements to define report layouts and identify data sources such as internal databases. Met with developers, project managers, and dbas to discuss project needs and development options for java/j2ee-based and reporting applications. Utilize Toad to execute SQL queries as needed for analysis of what is needed in reporting and to help troubleshoot issues with the data in reports. Analyze the SQL used to build the business objects web universes to identify opportunities and issues with how the data is being pulled through the queries. Create and manage tickets for enhancement and bug fix requests from scope to implementation. Assist the test team with creating test plans outlining what should be tested by IT and the users. Work with IT Support team to determine what tools are needed to support the business process as well as alerts and reports needed to provide visibility to issues. Utilized toad to perform data analysis in identifying data sources for the purposes of data mapping. 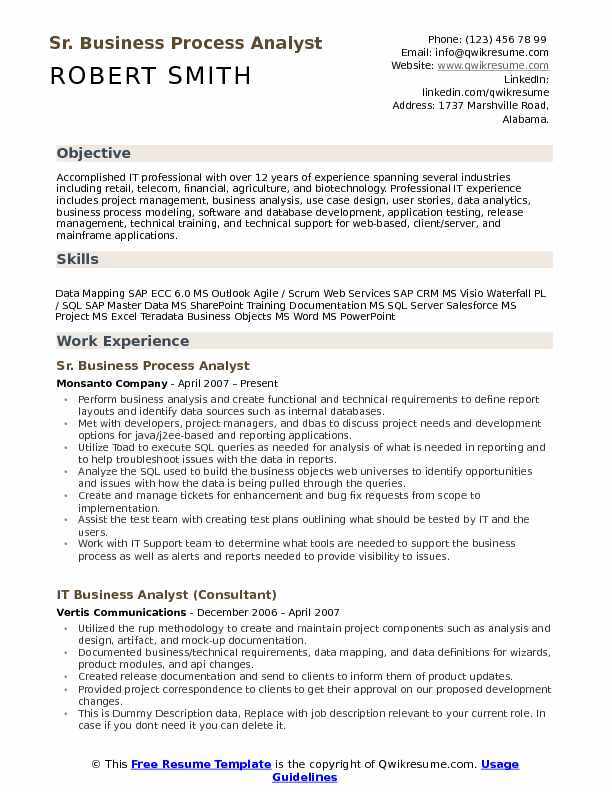 Summary : Business Process Analyst professional with over 10 years of experience in Technology that includes business process improvement, project management, implementation, training Extensive experience in business processes mapping, SAP CRM Sales and service, Web User Interface, SAP ECC, and Software as a Service (SaaS)". 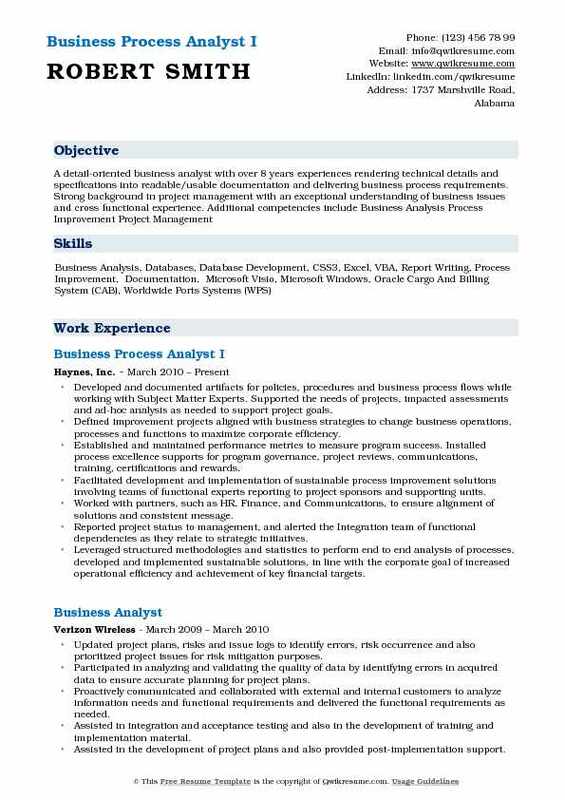 Experience in business process analysis including blue printing, gap analysis, translate business requirements into technical requirements. Defined and implemented sap CRM (sales and service module) as a sap CRM 7. 0 ehp1 for the 'inside sales' program target towards inactive customers and new prospects. Responsible for improving business process, technology and development of new solutions to drive more leads. Lead the discovery and conceptual design work required to translate business needs into solutions. Managed web initiatives included improvements on the public website by implementing a search engine. Develop and review process, systems training materials, and conduct training. Defined business processes, and streamlined the quote-to-cash process for order fulfillment. Prepared competitive analysis and performance benchmarks against key global competitors. 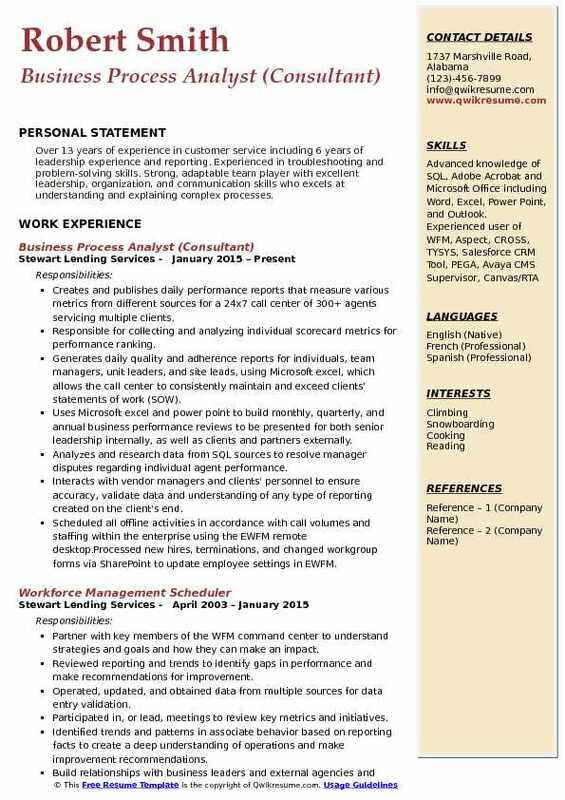 Headline : Assiduous and dedicated Business Process Analyst with 6 years of experience in complex projects and collaborating with IT to improve business processes. Adept at gathering business requirements and conducting data analysis to provide higher leadership with recommendations for improvement solutions with a specific emphasis on automating systems and streamlining processes. Work with senior leadership to identify current process weaknesses and develop solution plans utilizing six sigma tools (DMIC, process mapping, 5 whys, statistical analyses). Act as an SME and liaison between business leaders and IT analysts to ensure business requirements are met in the development of new processes and systems in order to streamline productivity and improve transparency and reporting processes. Develop and maintain functional specification requirements and at documents for new projects. Develop and conduct training for all teams on the utilization of new processes and continue to monitor progress via reporting tools. Ensured criminal and civil records were analyzed and reported in compliance with government regulations. Researched, recruited and trained new records acquisition specialists to ensure timely and efficient retrieval and fulfillment. Coordinated fulfillment specialists, records acquisition specialists, and court clerks for accurate and timely reporting. 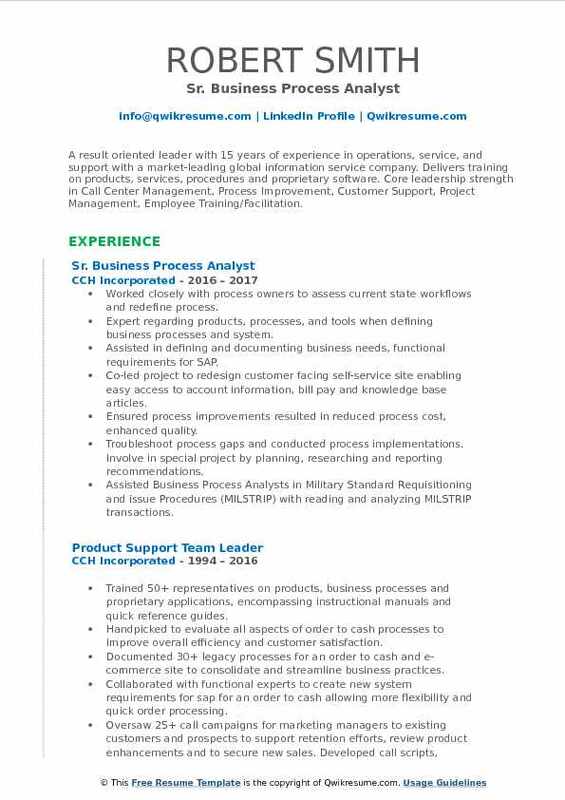 Summary : A result oriented leader with 15 years of experience in operations, service, and support with a market-leading global information service company. Delivers training on products, services, procedures and proprietary software. Core leadership strength in Call Center Management, Process Improvement, Customer Support, Project Management, Employee Training/Facilitation. Worked closely with process owners to assess current state workflows and redefine process. Expert regarding products, processes, and tools when defining business processes and system. Assisted in defining and documenting business needs, functional requirements for SAP. Co-led project to redesign customer facing self-service site enabling easy access to account information, bill pay and knowledge base articles. Ensured process improvements resulted in reduced process cost, enhanced quality. Troubleshoot process gaps and conducted process implementations. Involve in special project by planning, researching and reporting recommendations. Assisted Business Process Analysts in Military Standard Requisitioning and issue Procedures (MILSTRIP) with reading and analyzing MILSTRIP transactions. Summary : Seeking a Business Process Analyst, Data Analyst or similar position in an organization utilizing data extraction tools, methods, analytical thinking and relevant expertise to help the organization comprehend its long term goals. Over 10 years of Transportation and Logistics management experience. Extensive data analysis expertise in computer and information technology (I.T.) systems. Provided business process analysis, systems analysis and system support services requiring both in-depth knowledge and experience with the automated systems that support financial services, overseas and domestic. Provided thorough and above average customer service to government credit cardholders and fellow agency program coordinators (a/OPC) by following the guidelines of iso 9001. Assisted system users in the area of help desk support, training and other activities requiring an in-depth understanding of the function and/or the automated systems that support the function independently verified and validated that the document requirements meet business needs. Independently verified and validated the design of new workflows, new procedures, and new or revised automated systems. Supported the continuous improvement in the reconciliation of general ledger accounts with treasury and the production of cyclic financial statements through the identification of transaction errors, causes, and corrective actions -either through system modifications or user training. Supported the organization in resolving production system issues by identifying system gaps, assessing the impact of proposed changes to existing automated systems and documenting system requirements for proposed enhancements. Conducted and coordinated a cross-functional assessment of program, planning, requirements, design, test, and other artifacts. Developed and documented artifacts for policies, procedures and business process flows while working with Subject Matter Experts. Supported the needs of projects, impacted assessments and ad-hoc analysis as needed to support project goals. Defined improvement projects aligned with business strategies to change business operations, processes and functions to maximize corporate efficiency. Established and maintained performance metrics to measure program success. Installed process excellence supports for program governance, project reviews, communications, training, certifications and rewards. Facilitated development and implementation of sustainable process improvement solutions involving teams of functional experts reporting to project sponsors and supporting units. Worked with partners, such as HR, Finance, and Communications, to ensure alignment of solutions and consistent message. Reported project status to management, and alerted the Integration team of functional dependencies as they relate to strategic initiatives. Leveraged structured methodologies and statistics to perform end to end analysis of processes, developed and implemented sustainable solutions, in line with the corporate goal of increased operational efficiency and achievement of key financial targets. 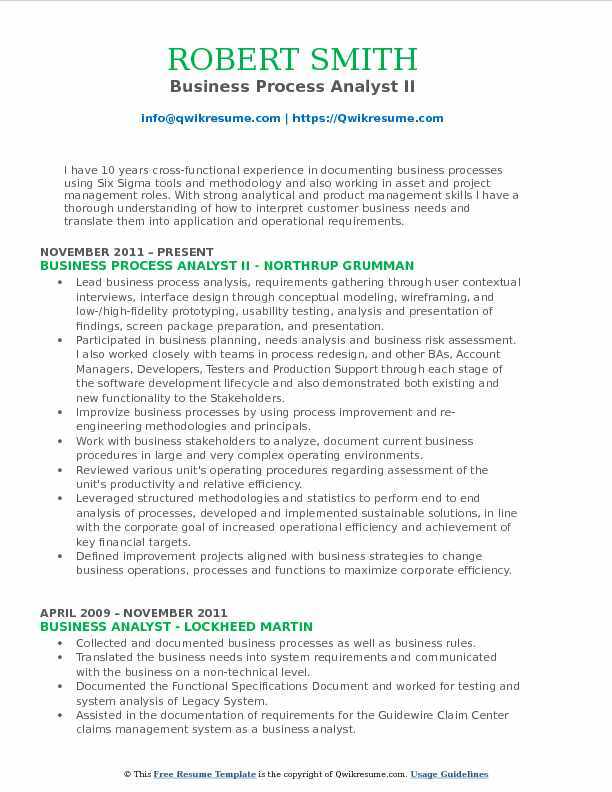 Summary : I have 10 years cross-functional experience in documenting business processes using Six Sigma tools and methodology and also working in asset and project management roles. With strong analytical and product management skills I have a thorough understanding of how to interpret customer business needs and translate them into application and operational requirements. Skills : Project Management, Customer Relationship Management, Conflict and Team Management, Organizational Change Planning Management, Requirements Management: Cost Business Analysis, Requirements Change Management, Requirements Traceability Matrix, Use Cases, Data Flow Diagrams and End User Training. JAD Sessions, Agile and SCRUM experience. Lead business process analysis, requirements gathering through user contextual interviews, interface design through conceptual modeling, wireframing, and low-/high-fidelity prototyping, usability testing, analysis and presentation of findings, screen package preparation, and presentation. Participated in business planning, needs analysis and business risk assessment. I also worked closely with teams in process redesign, and other BAs, Account Managers, Developers, Testers and Production Support through each stage of the software development lifecycle and also demonstrated both existing and new functionality to the Stakeholders. Improvize business processes by using process improvement and re-engineering methodologies and principals. Work with business stakeholders to analyze, document current business procedures in large and very complex operating environments. Reviewed various unit's operating procedures regarding assessment of the unit's productivity and relative efficiency. 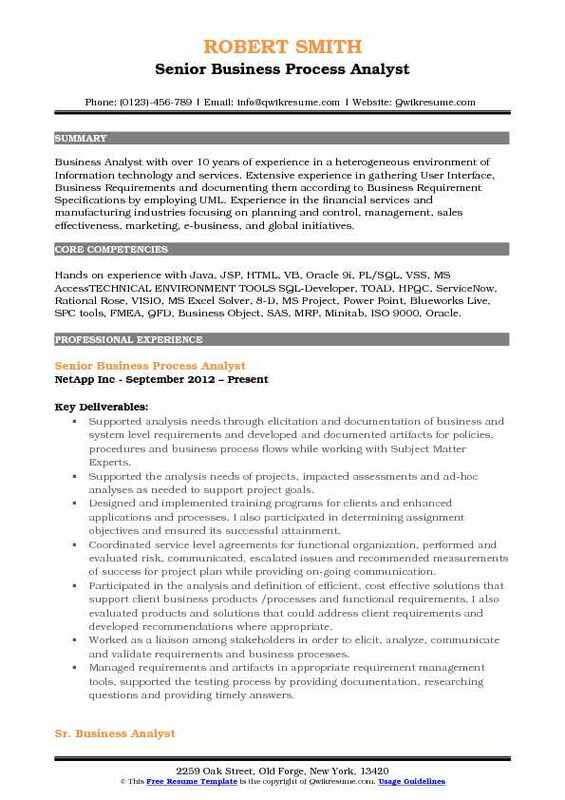 Summary : Business Analyst with over 10 years of experience in a heterogeneous environment of Information technology and services. Extensive experience in gathering User Interface, Business Requirements and documenting them according to Business Requirement Specifications by employing UML. Experience in the financial services and manufacturing industries focusing on planning and control, management, sales effectiveness, marketing, e-business, and global initiatives. Skills : Hands on experience with Java, JSP, HTML, VB, Oracle 9i, PL/SQL, VSS, MS AccessTECHNICAL ENVIRONMENT TOOLS SQL-Developer, TOAD, HPQC, ServiceNow, Rational Rose, VISIO, MS Excel Solver, 8-D, MS Project, Power Point, Blueworks Live, SPC tools, FMEA, QFD, Business Object, SAS, MRP, Minitab, ISO 9000, Oracle. Supported analysis needs through elicitation and documentation of business and system level requirements and developed and documented artifacts for policies, procedures and business process flows while working with Subject Matter Experts. Supported the analysis needs of projects, impacted assessments and ad-hoc analyses as needed to support project goals. Designed and implemented training programs for clients and enhanced applications and processes. I also participated in determining assignment objectives and ensured its successful attainment. Coordinated service level agreements for functional organization, performed and evaluated risk, communicated, escalated issues and recommended measurements of success for project plan while providing on-going communication. Participated in the analysis and definition of efficient, cost effective solutions that support client business products /processes and functional requirements. I also evaluated products and solutions that could address client requirements and developed recommendations where appropriate. Worked as a liaison among stakeholders in order to elicit, analyze, communicate and validate requirements and business processes. Managed requirements and artifacts in appropriate requirement management tools, supported the testing process by providing documentation, researching questions and providing timely answers. Summary : Over 13 years of experience in customer service including 6 years of leadership experience and reporting. Experienced in troubleshooting and problem-solving skills. Strong, adaptable team player with excellent leadership, organization, and communication skills who excels at understanding and explaining complex processes. Creates and publishes daily performance reports that measure various metrics from different sources for a 24x7 call center of 300+ agents servicing multiple clients. Responsible for collecting and analyzing individual scorecard metrics for performance ranking. Generates daily quality and adherence reports for individuals, team managers, unit leaders, and site leads, using Microsoft excel, which allows the call center to consistently maintain and exceed clients' statements of work (SOW). Uses Microsoft excel and power point to build monthly, quarterly, and annual business performance reviews to be presented for both senior leadership internally, as well as clients and partners externally. Analyzes and research data from SQL sources to resolve manager disputes regarding individual agent performance. Interacts with vendor managers and clients' personnel to ensure accuracy, validate data and understanding of any type of reporting created on the client's end. Scheduled all offline activities in accordance with call volumes and staffing within the enterprise using the EWFM remote desktop.Processed new hires, terminations, and changed workgroup forms via SharePoint to update employee settings in EWFM. Headline : To greatly improve your organization with my multifaceted, highly-adaptable program and project management skills and experience. I have the ability to work in high-pressure environments; while exceeding goals, company expectations, and individual responsibilities. Develop, manage, and implement business process improvement projects using lean methodologies.Perform structured and creative analysis of current business processes to identify improvements. Assist IT and the business in implementing strategic transformation initiatives as well as continuous improvement programs.Provide subject matter expertise to information technology in support of business. Understand and calculate the impact of projects and business processes on the organization. Analyzed business needs and drafted process maps. Actively participate with projects teams to ensure proper control and process compliance. Evaluate data collected through task analysis, business process, surveys, and workshops. Scheduled meetings with managers and technicians for prompt and efficient resolution of issues and troubleshooting. Arranged training sessions for contractual employees on business process. 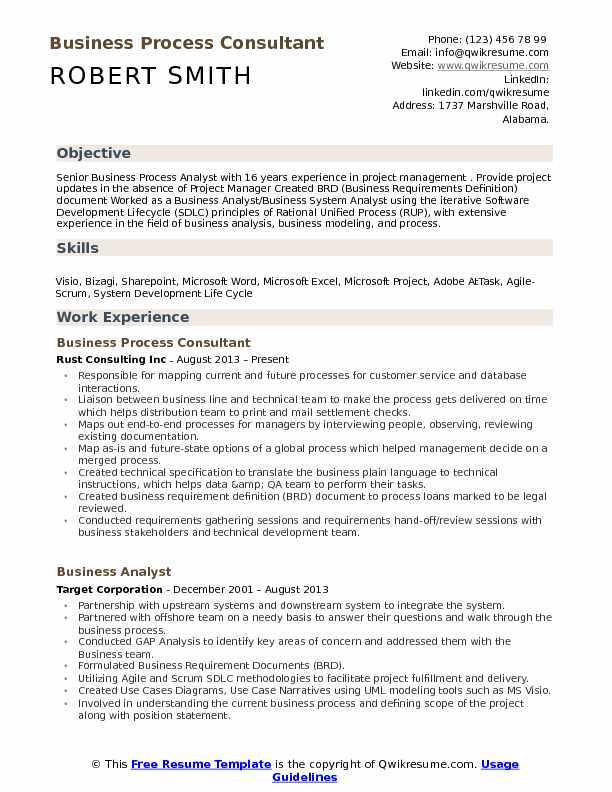 Summary : Senior Business Process Analyst with 16 years experience in project management . 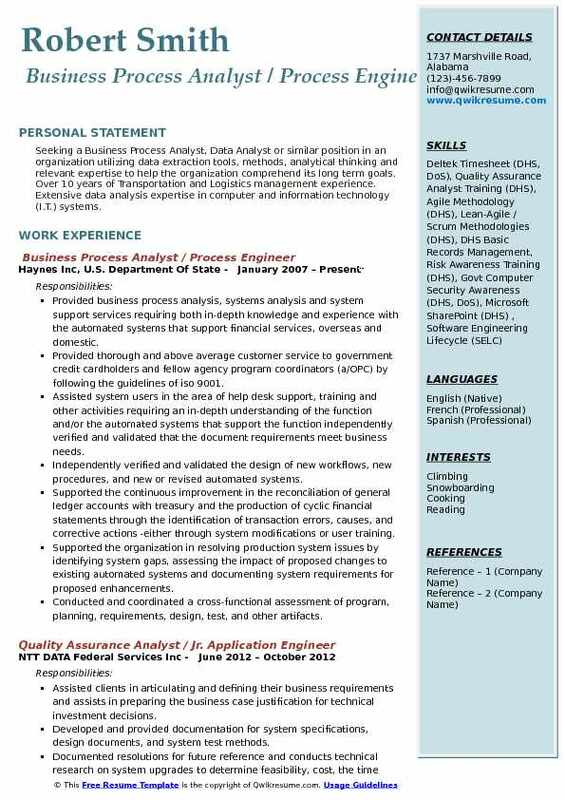 Provide project updates in the absence of Project Manager Created BRD (Business Requirements Definition) document Worked as a Business Analyst/Business System Analyst using the iterative Software Development Lifecycle (SDLC) principles of Rational Unified Process (RUP), with extensive experience in the field of business analysis, business modeling, and process. Responsible for mapping current and future processes for customer service and database interactions. Liaison between business line and technical team to make the process gets delivered on time which helps distribution team to print and mail settlement checks. Maps out end-to-end processes for managers by interviewing people, observing, reviewing existing documentation. Map as-is and future-state options of a global process which helped management decide on a merged process. Created technical specification to translate the business plain language to technical instructions, which helps data & QA team to perform their tasks. Created business requirement definition (BRD) document to process loans marked to be legal reviewed. Conducted requirements gathering sessions and requirements hand-off/review sessions with business stakeholders and technical development team. 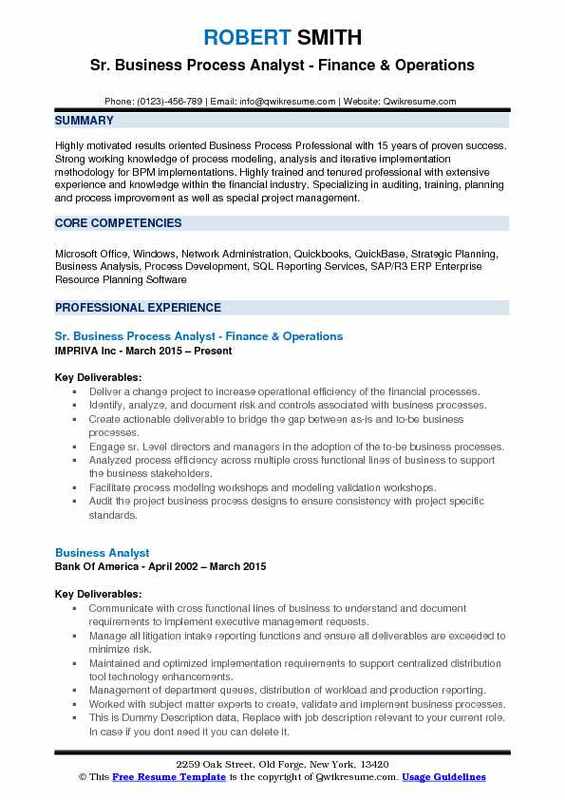 Summary : Highly motivated results oriented Business Process Professional with 15 years of proven success. Strong working knowledge of process modeling, analysis and iterative implementation methodology for BPM implementations. Highly trained and tenured professional with extensive experience and knowledge within the financial industry. Specializing in auditing, training, planning and process improvement as well as special project management. Deliver a change project to increase operational efficiency of the financial processes. Identify, analyze, and document risk and controls associated with business processes. Create actionable deliverable to bridge the gap between as-is and to-be business processes. Engage sr. Level directors and managers in the adoption of the to-be business processes. Analyzed process efficiency across multiple cross functional lines of business to support the business stakeholders. Facilitate process modeling workshops and modeling validation workshops. Audit the project business process designs to ensure consistency with project specific standards.